Welcome to a place of unconditional love and unexpected blessings. When widow Rose Schrock turns her Amish farmhouse into a bed and breakfast, she expects there might be problems. The reaction of her cantankerous mother-in-law for one. Disapproval from the church for another. But what she doesn’t expect is that the guests at the Inn at Eagle Hill will spill their problems into her life and into her heart. She also never expects the kind of help and support she gets from Galen King, the quiet and rugged horse trainer next door. Love, Rose discovers, can bloom in the most unexpected ways. With inspiration from a true story and her signature plot twists, best-selling author Suzanne Woods Fisher invites you back to Stoney Ridge for a fresh story of simple pleasures and strong faith in a complex world. 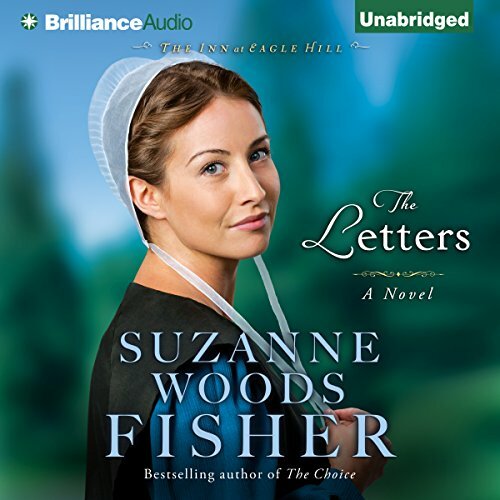 ©2013 Suzanne Woods Fisher (P)2013 Brilliance Audio, Inc.
What did you love best about The Letters? The entire story was excellent! Rose because she was so loving and kind. Which character – as performed by Amy McFadden – was your favorite? It would be hard to choose one. She did an outstanding performance of them all. This is a book I will listen to again. I'm looking forward to the entire series and hope the same narrator reads. Lovely Novel with Multiple POVs! Suzanne Woods Fisher possesses something no one else has--her voice. That certain Suzanne voice that defies description and when I've tried I've mangled it. And the narrator of this book does a superb job of capturing the Suzanneness that I love. You're introduced to a household of characters and some from nearby and some from out of the area. But even with all the cast of characters each one has his or her own voice and unique traits. Even if the listener doesn't agree with the choice the doctor's wife makes (or choices) by the end of the story you'll find yourself accepting them and seeing how it could work. This secondary plot line was extremely well done. Rose Schrock is a special heroine and Galen King a subdued but persuasive hero for the story. Loved how Suzanne had this one twist with the step-daughters "boyfriend." And the plot line with the underlying medical condition. I am trying to not do any spoilers. I am not your typical Amish book reader but I find Suzanne writes her books with a complex plot line and extremely well-developed characters. And she reliably produces an excellent product. I like reliability! I loved listening to this book! susanne woods fisher is one of my favorite authors. Amy McFadden did a wonderful job of bringing this story to life!! thank you!! With a load of responsibilities, Rose Schrock faces each day with her head up and a smile on her face . . . raising four kids on her own after her husband's untimely death, while caring for her cantankerous mother-in-law, Vera, Rose has to figure out a way to make a living . . . while staying in the good graces of the church . . . with the bishop's blessing, Rose launches her bed and breakfast . . . opening the doors to healing and comfort, not only for her guests, but for her own family . . . when Delia Stoltz, the wife of a well known doctor comes to stay, she and Rose become friends . . . and Delia finds sanctuary and peace in the Amish inn . . . wonderful, gentle, thoughtful listen . . .
couldn't get into characters, drug on too long. won't stop me from trying another from author or narrator though. A story that makes you think. Encouraging story from one of my favorite Amish/Mennonite authors. Suzanne Fisher's characters are believable and memorable. I am really enjoying learning more about the community of Stoney Ridge.